Is there a better alternative to Home Weather Center? Is Home Weather Center really the best app in Internet Utilities category? Will Home Weather Center work good on macOS 10.13.4? 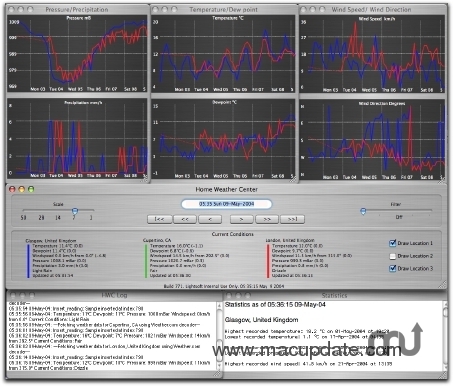 Home Weather Center (HWC) is a weather graphing, monitoring and analysis application for Mac OS X. HWC is designed as a virtual weather station using Internet based weather sources rather than the more traditional and costly hardware based sensors. Version 1.87: Release notes were unavailable when this listing was updated. Home Weather Center needs a rating. Be the first to rate this app and get the discussion started! As data is gathered and stored in its database HWC allows you to view weather statistics such as the lowest temperature, or the highest wind speed over any time period stored in the database. In addition HWC contains a journal for weather notes and can generate Web pages containing current conditions, graphs, statistics and a web-cam image. HWC can upload these Web pages to your server for display via a Web browser anywhere in the world. HWC also monitors the weather and can run a set of pre-defined and user programmed alerts that can trigger emails, send SMS messages to your mobile phone and/or run scripts should an alert trigger. Continuous and unlimited recording, monitoring and analysis of weather data for up to three locations. Provides graphs of temperature, dew point, wind chill, wind speed, wind direction, precipitation and barometric pressure. Can graph and display conditions for any date in the database; dates can be entered using natural language; for example 'last wednesday'. Graph scales range from 1 to 56 days. Continuous statistics calculation and display. Continuous database timeline maintenance; if HWC misses samples, data is interpolated between last know good sample and the latest. Database query facilityï¿½ for example querying the total rainfall over a given date range. A journal, linked to the database for recording your own weather notes. Web page generation and upload to Web server of current conditions, graphs, Web cam image, statistics and journal. Export of data from any date range within the database. Supplied with four sources of weather data ï¿½ weather.com, The Weather Underground, METAR and NOAA. Plug-in decoder architecture; users can interface HWC to their own weather sources ï¿½ for example hardware based weather stations. Three pre-programmed alerts; ice, rain and clear sky. HWC can send email, SMS message (via modem) and run scripts when an alert is triggered. In-built test system for custom alerts. Independent units for each of the six main data types. Speech of any of the three locations. Daily data email; sends tab-delimited data email for any or all locations.